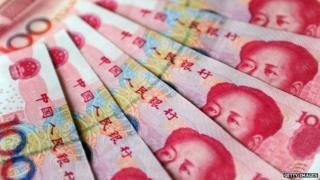 China was the world's third largest investor in 2013 for the second year running, according to state news agency Xinhua. Outbound direct investment (ODI) from China reached a record high of $108bn (£66.98bn) last year, a 22.8% rise on ODI made in 2012, the agency said. Meanwhile, on Sunday the government said it would relax rules for Chinese companies making overseas investments. The new rules will take effect on October 6. Published by the Ministry of Commerce on Sunday, Xinhua said the new procedures for domestic companies were "aimed at allowing more freedom for outbound investment". At the moment, any overseas investment project worth more than $100m needs to be approved by the ministry. However, any investments made into projects overseas "in sensitive countries or regions, as well as in sensitive industries" would still require approval by the government, the agency said. China may have been the world's third-largest investor in 2013, according its own data, but this year the numbers may change. According to figures collected by The Heritage Foundation, an American think tank, China's investment around the world contracted in the first half of 2014. The foundation's data covers large Chinese investments and contracts worldwide. Australia, the US, and Canada remain the most popular destinations for investment out of China, followed by Brazil and Indonesia. About half of all the money invested overseas by China and Chinese companies since 2005 has gone into the energy and power sector.